We will be joining City Equity Theatre Birmingham Alabama February 28- March 10 2013. Get your tickets now. I look forward to meeting everyone. I will be sharing stories from our recent visit to the Eastern Congo. We have selected the three countries we will be working in next. They are Liberia and Jamaica.Fact finding has already started. Love your input. 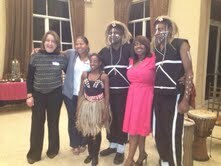 Also a big welcome to our brand new chapter, Footprints Foundation Boca Raton. We are very excited at Footprints Foundation as we welcome Dr. Mary Jo O’Sullivan Professor Emeritus Obs& Gyn University of Miami and Dr.Nahida Chakhtoura Assistant Professor of Clinical Obs& Gyn University of Miami to our Board.